Well, PETA is making waves in the fashion world once again and this time they've turned their attention on Anya Hindmarch. Now, we have to start by saying that we snapped the above picture while attending the press day earlier this week. The initial thought was, "what an adorable window display." The picture was snapped and there were thoughts of a latergram in the books. That's all been turned on its head now after hearing that PETA has a thing or two to say about the ducking display. "There is no such thing as an ugly ducking, but there are ugly handbags. We're sure that this ghastly window display will deter more customers than it draws in and put the company on the 'shun' list for caring customers. They may look cute but they are only cute when they are alive." First off, PETA, starting your statement with a slam on Anya Hindmarch's bags is just strange. If you have a problem with the window, keep the focus on the window, as clearly Ms. Hindmarch's bags are anything but ugly. In fact, they are some of the best selling bags in the UK. 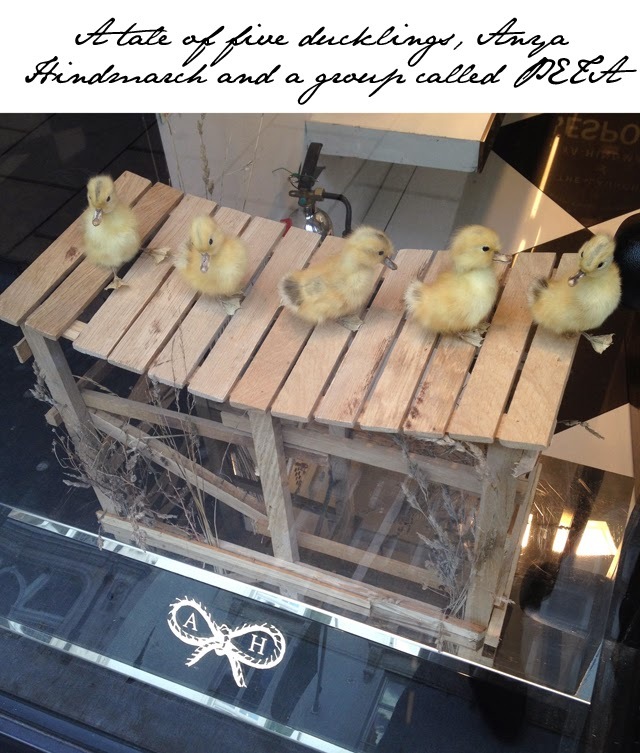 As far as the ducklings are concerned, it has been reported that Anya Hindmarch has stated they are antiques purchased from an antique market.